Mulally and Bill Ford at today's annual meeting. “It's very early days in our recovery and we still have a lot of debt. The most important thing we can do as a company is get the balance sheet in order,” Ford said. WILMINGTON, Del. (Bloomberg) -- Ford Motor Co. CEO Alan Mulally, who ended three years of losses in 2009 as rivals slid into bankruptcy, said the automaker's earnings next year will improve on “solid” profit in 2010. Mulally said new models such as the redesigned Focus small car and strengthening demand will let Ford extend this year's pretax profitability. His outlook follows concern the automaker expressed last month about higher commodity prices and a fragile economic recovery. The CEO is attempting to overcome investor skepticism reflected in a stock slide more than three times deeper than the Standard & Poor's 500 Index's drop since Ford posted $2.1 billion in quarterly net income last month. Investors betting on Mulally's turnaround drove up the shares more than eightfold from mid-November 2008 through April 26, when they reached $14.46, a five-year high. Since April 26, Ford has fallen 12 percent through yesterday in New York Stock Exchange composite trading, outpacing the S&P 500's 3.3 percent decline. The company's 2011 net income will climb to $6.5 billion, excluding one-time items, from $5.2 billion this year, according to the average of analyst estimates Bloomberg compiled. Mulally reiterated today the “solid profits” forecast for 2010 that he first made on April 27. The company won't backslide as it has in past recoveries because Ford has slashed costs and executives are on guard for any complacency creeping into the workforce, Executive Chairman Bill Ford said. Ford competes against stronger U.S. automakers than it did in February 2009, when it traded for less than $2 and Spotts, the portfolio manager, began accumulating shares. General Motors Co. and Chrysler Group LLC were headed into court protection at the time, and both since emerged bolstered by government-backed restructurings. Mulally engineered Ford's revival by rebuilding its namesake brand, leading the automaker to a $2.7 billion profit last year. Bill Ford said Mulally can remain in his post as long as he desires. Mulally turns 65 in August. 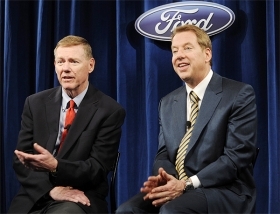 Mulally joined Ford from Boeing Co. in 2006 and is presiding over his fourth annual meeting. Since his arrival, Ford cut its North American workforce by 47 percent and is now rolling out fuel-efficient small cars such as the Fiesta. The company avoided the fate of its U.S. competitors by borrowing $23 billion in late 2006 before credit markets froze. The automaker put up all major assets, including the Ford name, as collateral to build a cash cushion to withstand losses while developing new models. Bill Ford said today the company must reduce debt before restoring its dividend. Shareholders rejected a proposal opposed by directors to strip the Ford family of its 40 percent voting control of the automaker, the sixth straight such failure. The proposal won the backing of 29.2 percent of the shares voted, its highest ever. Last year, 19.5 percent supported it. The board includes two family members, Bill Ford and Edsel Ford II.